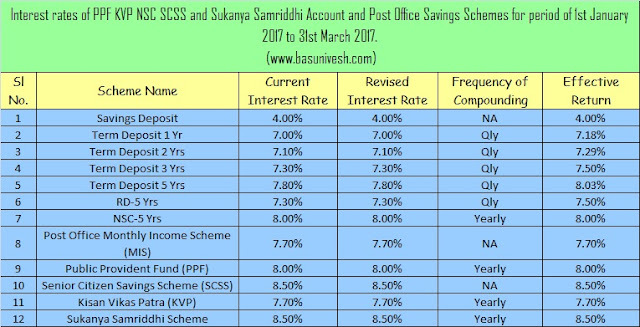 Home > Post Office Savings > Post Office Term Deposits, MIS, SCSS, PPF, Sukanya Samriddhi, NSC, KVP Interest Rates January-March 2017..! Post Office Term Deposits, MIS, SCSS, PPF, Sukanya Samriddhi, NSC, KVP Interest Rates January-March 2017..! Post Office Term Deposits, MIS, SCSS, PPF, Sukanya Samriddhi, NSC, KVP Interest Rates January-March 2017 were declared. These interest rates will be applicable from 1st January 2017 to 31st March 2017. First, recap the changes done to all Post Office Savings schemes for the year 2016. Earlier the interest rates used to be announced on yearly. However, now from 2016-17 the rate of interest will be fixed on a quarterly basis.